IN his continuing search for the more weird, whacky and wondrous in the world of travel, David Ellis says a former journalist colleague in Australia and now long-time resident of New Caledonia's Isle of Pines, Hilary Roots has dropped a note after reading us online to point out how the weird and wonderful can be right under our very noses in our very own backyards. 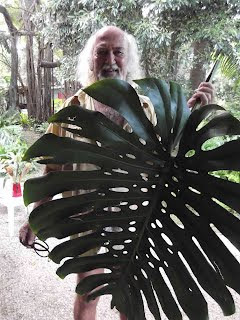 Hilary's Swiss partner and beachwear designer well-known to Aussie visitors to the island, Albert Thoma found inspiration for his latest collection of pareos (sarongs) and T-shirts in the grandiose leaf of a plant growing naturally in the shade of a spreading banyan tree right in front of his kitchen window. The leaf is that of a plant common to tropical and sub-tropical climates, Monstera Deliciosa, that's more popularly known as Philodendron and the fruit-salad plant because its cylindrically-shaped fruit tastes like a blend of fruits. Albert has had a wood-cut made of the leaf of his Monstera Deliciosa, applies paint to this and then lays his pareo and T-shirt material delicately on top, rubbing it Hilary says, the way we did coin rubbings when we were children. Once the paint is transferred, the material is sun-dried and the pattern fixed with a hot press. As our pictures show, Albert's Monstera Deliciosa leaves are anything in size but the potted, cultivated ones many of us grow, or try to grow, indoors here in Australia… and how effective are his wood-cut patterns on those T-shirts and pareos? If you're visiting the Isle of Pines you'll find Albert and Hilary at Créations Ile des Pins next to the Gendarmerie. Say hello to Hilary (who is known as Cleo on the island and originally hails from New Zealand,) and consider one of Albert's T-shirts or pareos as a memento of your visit.